Important Spiritual Prediction/Forecast (Paish Khabri) By Hazrat Shaykh Abdul Qadir Jilani (RA) is presented from this book. According to Anwar-e-Sabri, this prediction is originally in Maktoob-e-Nitab ‘Qurbat-tul-Wahdat’ written by Shaykh Muhiyyudin Abdul Qadir Jilani RA (Qutab and Ghawth of the Eternal Lord). His successors include Khawaja Shams-ud-Din Turk Pani Patti, Shah Abdul Qudoos Gangohi, …………………………………… and Abu Anees Sufi Barkat Ali. This entry was posted in Hazrat Abdul Qadir Jilani RA, Hazrat Fariduddin Masud Ganjshakar RA. Bookmark the permalink. MashaAlah !jazakAllah !Are you sure that Haji ImdadUllah and Sufi Barkat Ali RehmatUllah alayehim ajmaeen are from chishti order? @Hussain Yes dear, Sufi Barkat Ali RA do extreme love & respect to Ali Ahmad Sabir Kaliyari RA. Above book is a proof of this, For me, above book was written by Sufi Barkat Ali RA, these are his words, I am sure. (He may be bait in Qadri order as well – Wiki), Please seehttp://en.wikipedia.org/wiki/Alauddin_Sabir_KaliyariHaji Imdad Ullah Muhajir Makki RA was from Chishtia order. 100% Sure. and Haji Imdad Ullah Muhajir Makki RA blessed Pir Mehr Ali Shah with Sabriya Order. Wa Alaikum Salaam Mujahid Bhai.Kia wo khabar hamarey president ki beemari aur mulk sey bahir janey ki hai? Ya phir baal thakrey ki nawasi ke muselman sey shadi karney ki khabar hai? Asslaam Aleykum tum dunya main is trah raho, k dunya tumharey andar na rahey, agar dunya tumharey andar rahey gi, to is k kaaley pardey tumhari aankhon par, tumharey kanon, par tumharey dil par rukawat kardengey. na tum is rukawat ki waja se koi poshida aalam ko dekh saktey ho , na rijalul ghaib ko dekh aur sun saktey ho, goya k ap maarifat ki dolat se mahroom rehtey ho, aksar log internet, tv aur is trah ki bohat si sahulat ki chizain wagera use kartey hain, lekin is se sirf nafs ki enjoyment letey hain, aur apney liye maarifat k darwazey band kartey jatey hain, kyun k gunahon ki waja se dil siyah ho jata hey, phir marifat ki khabar ka shaoor nahi rehta. unkey khawab aur khyal sab pragnda ho jatey hain, sachey khawabon aur maarifat se mahroom rehtey hey.Dar Asl main tc internet wagera ki khabron ki baat nahi kar raha tha, main to aaney waaley waqeaat k kashf ki baat kar raha tha. aur wo Groh Muslmanon ko azziyat deney wala aur Islam ko Nuyqsan pohanchaney wala Groh hey, Pakistan k andar bhi aur baaher bhi, ALLAH HAMAIN KASHF AUR MAARIFAT KI DOLAT SE SERAAB FARMYAAE AUR APNI RAZA WAALEY KAAMON MAIAN SABAT QADAM RAKHEY AUR GUNAHON SE BACHAAYE AAMEEN SUMMA AAMEEN. @AKIf you read the blog's fb status, I emphasized to read it again n again with help of English translation. or download the book and read it. Itni bhi mushkil baatain nahin likhien. I have given so much details and hints but…… ;'( First I thought to explain it during posting, but then I stopped due to some reason and posted the 'Farman' of Ghaus-e-Azam RA. @Faisal:Daaba tul Ardh is not internet…….Daaba Tul Ardh has been mentioned in Sura Ad Dukhan clearly,if i am not wrong.Daaba Tul Ardh will appear after the appearance of Mahdi alaye hi Salam and even after the return of Isa Alaye hi salam,if i am not wrong.there is a consensus on it. @Mujahid IslamAssalmu Alaikum@"aaney waley waqt main tornedo qism k waqeaat hongey"The increase in the occurrence of tornadoes is a portent of the End Times.ADNAN OKTAR: Yes. The increase in the number of tornadoes is again reminding us about the End Times, it reminds us about Allah. It is clearly seen that these are happening for that purpose. That is because after 1980 unprecedented events started to take place. Now a decrease in the velocity of the sun has attracted attention. That was a news item in the papers. These are all portents to state that the Day of Reckoning is imminent. Allah is making us feel this gently, or He is making us feel strongly..
@HussainAssalamu Alaim, Both Imam Mahdi (as) and Prophet Jesus (as) are present in world but they just not appeared. So Dabtul Ardh is also present :)"And when the Word is fulfilled against them (the unjust), We shall produce from the earth a Beast to (face) them: it will speak to them,'"(al-Naml 27.82) (The first of the signs to appear will be the rising of the sun from the west, and the emergence of the beast to mankind in the forenoon. Whichever of them appears first, the other will follow close behind it. )[ Reported By Muslim in his Sahih]We have already discuss this topic so don't want to discuss it again. @AKNice work, I want to add two points here, just for you.1. This prediction was also written a in book published 155 years ago even before war of independence so its a credible prediction. I will post that but the prediction is same. 2. 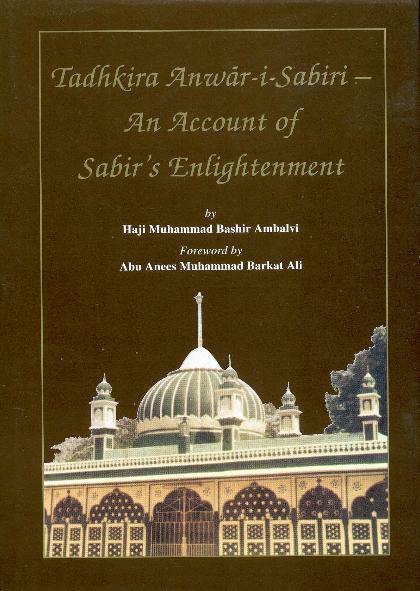 According to Haji Bashir Anbalvi author of this Anwar-e-Sabiri Book, That Mujaddad was Sufi Barkat Ali QSA, Do you remember the prediction of Sufi Barkat Ali (Worlds Decision will take place in Pakistan's Yes or No), He is still active…., Now come to the important part as you said the time of this mujaddid is APPROX. 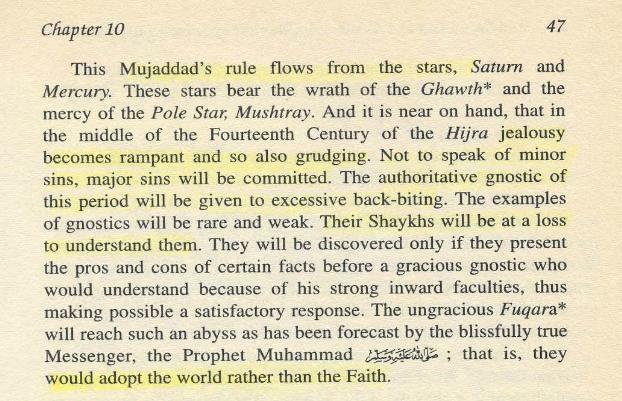 the same as that of Imam Mehdi (AS)…………………Well you know what it means? 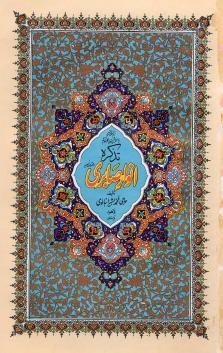 After Mujaddid, time of Imam Mahdi AS is near. (and Allah knows the best) One important line was written in that 155 years old book, which I will not tell.Suspense…!! @FaisalWa Alikum AssalamWell, Its an other confirmation by the Chief of Saints. 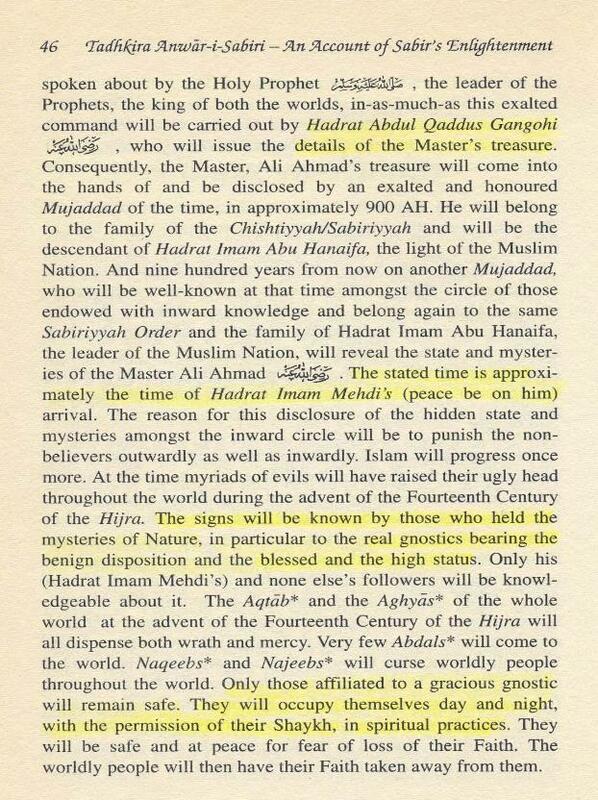 As I told in above comment, It is also written in 155 years old book and it is according to Hadith. These saints had deep knowledge of Quran & Hadith. Nothing new. Its writing on the Wall whether someone believes or not. Asslaam Aleykum Mujhey herat horahi hey Mr. Kaya Palat Shaareh pe hahaahahha, jnaab apko kis ne keh diyaaaak computer aur internet daaba tul ard hain really apki is baat pe mujhey bohat hansi arahi hey . Kaya palat ka khitaab aap pe bilkul fitt beth ta hey hahahahahahyahan kisi ne zaedari k barey main puchha heykya waqaee aap jannaa chahtey hain mene uska hisaab lagaya hey mujhey is pe bhi hansi arahi hey baat hi kuchh esi maloom hui hey yani usey phaenti lagai gai hey hahahahhahaphaenti bhi muhibbey watan logon ne lagai hey , uska to boriyaa bistar gol hogasaath hi uski chahiti party ka bhi . @ mujahid browese khabrain to a rahi hain kiya kuch hone wala hai whos next bilawal,zardari imran ya kon? Zardari ka akhri time a gya hy. Is liay tu us ny Bilawal ko Pakistan bheja hy. Aur us ny atay sath hi PM Gillani sy baat ki. Zardari ka koi important msg dya ho ga. It means k situation serious hy. Ab Govt. k janay main kuch hi din reh gy hein.Mujhay pata lga hy k next President Gen Kayani ko bnaya jaey ga. Lekin pehlay wo apni post sy resign krein gy. Un ki back py Army & Supreme Court hn gi. Phir ye mil kr achay logon ko chun kr Govt. bnain gy. PM k liay Imran Khan ya phir aik aur bnday k naam lia ja rha hy.Is Govt. k kam ho ga k sb dolat bahir k banks sy wapis lai jaey. Jo inkaar kry ga us k sath zabardasti ki jaey gi. Aur ye new Govt. foreign aid pr inhisaar krna bhi khatam kr dy gi. @ABDUL: I have already discussed characteristics daaba-tul-ardh with many Hadiths in following article of same blog…http://spiritual-pakistan-future.blogspot.com/2011/11/master-of-time-took-over-power-sheikh.htmlDaabe is not animal, big foot or ghost because it will bring out (KHURUJ) from earth. Tell me one thing Who can speak like humans?? ?Only those creations of Allah who have soul like Humans, Angels and Jinns. Animal can't speak as they have no soul (ruh). They have only life (jaan). They can only communicate like animals communicated with Prophet Solomon. Language of animals is not like humans.Sperm has also life but angel put ruh in fetus after some period in mother's womb. It is not case for animals and plants. Give me any example who can speak like humans except Jinn and Angel? Daabe will speak with each human with his own language. It is not only Internet but all technologies created or come out (KHURUJ) from earth.Open Chapter 27, Verse no. 82“Wa-itha waqaAAa alqawlu AAalayhim akhrajna lahum DABBATAN mina al-ardi tukallimuhum anna alnnasa kanoo bi-ayatina la yooqinoona”A close translation is:“And when the word is fulfilled concerning them, We shall BRING FORTH a beast/creature from THE EARTH to speak unto them because mankind had not faith in Our revelations.” Well , before going to technical analysis , I need to clarify certain important aspects of this verse . Firstly , this verse is talking about future . The Arabic word ‘WAQAA’ means to happen , to take place etc. We also can know it by the adiition ‘TU’ in front of the verb “KALLIMUHUM’ which menas SHALL DECLARE / SPEAK/TELL etc. Secondly , most important thing is the ‘BEAST/CREATURE’(Arabic DABBA) in this verse is a metaphor which is not a living CREATURE at all . All the other verses in Qur’an ALLAH Almighty used the word ‘KHALAQA’ for them which means ‘TO CREATE’, a biological process , but only for this verses HE used ‘AKHRAJNA’ for the beast of this verse .‘AKHRAJNA’ came from the root ‘KHURUJ’ means EXIT , GO OUT , BRING FORTH , BRING OUT . Hence this ‘AKHRAZNA’ is not a biological production rather seems like some type of instrumental process . This is more confirmed when we read the following verse from Qur’an :[24:45]“And GOD created (KHALAQA) every creature (DABBA) from water. Some of them walk on their bellies, some walk on two legs, and some walk on four. GOD creates whatever He wills. GOD is Omnipotent.”In the above verse ALLAH , the Magnificent spoke of the living creatures who were created (KHALAQA and not AKHRAJNA) from WATER . But in verse 27:82 we can see that that symbolic beast is made from THE ERATH and not from water . hence it is not a living creature at all.I am not forcing anyone to believe it. Imam Mahdi (as) and Prophet Isa (as) will tell batter. Insha'Allah. @Mujahid:Aap ka khitaab waqai bht dlchasp hai.bad qismati se aaj k logon ne har cheez ko apne ilm k mutabiq unn cheezon se judge kerna shuru ker dia hai jo aqal mein ati hain ,wo muhayyur ul uquul ya ajeeb ul khalqat cheezon ko accept kernay k liye tyar nahi.Esay he kuch logon ne internet ko daaba keh dia hai.haalan k haji rafee ud din dehlavi RehmatUllahi Alayeh(agar mein ghalat reference nahi dae raha toh yehi naam hai ghaliban unn ka) ne daaba ki description di hai jo daaba ki uss description se milti hai jo bible ya mukashifat e Danyal alaye hi salam mein se kisi ek main hai.lakin sabr kerain waqt anay pe aqal pe inhesar kernay walay logon ko pata chal jaye ga k haqeeqat kya hai. @Mujahid:nihayat adab o ehtram k sath ek ikhtilaf kernay ki gustakhi ker raha hun k hadith ki roshni mein toh dajjalka nikalna ghazwa e hind k foran baad ho ga aur Imam Mahdi alaye hi salam ghazwa e hind k ikhtitam se pehle he zahur farma chukay hon ge.Yeh sab ahadith se zahir hai.lakin aap k mutabiq yeh events dusray aur chothay daur mein hon ge yani time difference ho ga.WAllahu Aalam. @Mujahid and KhanExcellent comments, thanks for sharing info. and What Khan said quoting again here"hamain haalaat wa waqiyat ko Quran wa Hadith aur seerat tul Nabbi(S.A.w)ke bunyad per ghoor wa fikr kar ke dekhna chahiyhar qism ke halat mein hum ko Haqq aur Sach pe qaim rehna chahiay. kunke aaj kal Dajjl(faraib) kazamana hai jo halat zahir main hotay hai zoroori nahi ke wo asal mein be waisay ho.Allah Pak hum sub ko Dajjal aur Shaitan ke fitnon se mehfooz rakhay! Amin "Alhamdulillah,Meri kosish bhi yehi hai ki hr Pakistani yaqeen rakhe k InshaAllah halaat change honge, mayoosi ki koi baat nahin. @Khan Well said brother"Hamain kisi ke ikhtilaf kerney se dil main koi kodurat wa bughz nahi rakhna chahiy.Ikhtilaf agar thoos dallail(arguments) ke bunyad per ho to iss ka maza ata hai.Hamain sirf zahiri khabron wa waqyat pe nahi jana chahiya"We should give strong arguments unlike give any title to others like Kaya Palat. We should give research of great scholars/walis of Hadith and Quran unlike our own thoughts (Khial). @ Mujahid E Islam:Mujahid Bhai, Zindabad, Mujahid Bhai, Zindabad :)Seriously though, Allah apke darajaat buland kre! !Thanks for your contribution!! @abdul and all:check thishttp://news.yahoo.com/big-moscow-protest-rally-against-vote-fraud-begins-110813775.htmltime for tsars to come back has arrived !!! @anonymous:i know but if this movement gains potential,it will create anarchy in russia leading the democratic system to a fall or suspension. 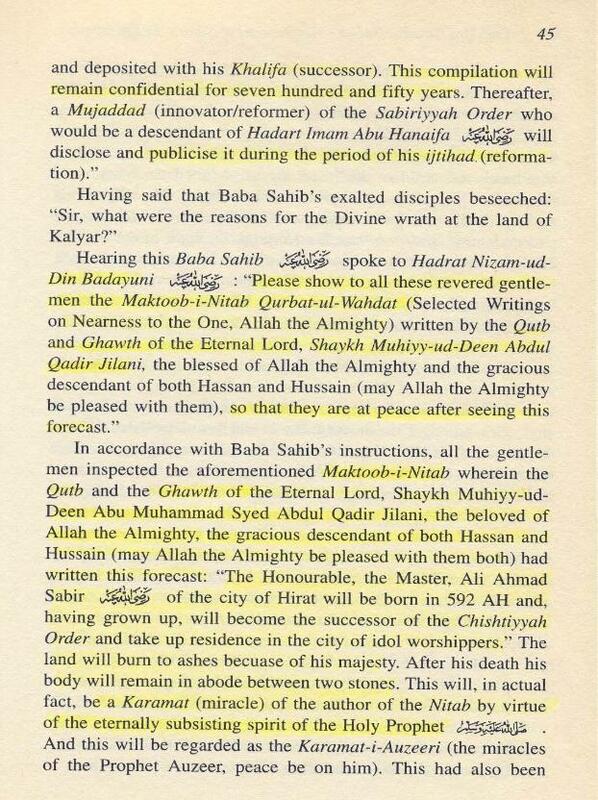 Aslam O Alaikum Admin Brother @Faqr E Ghaoor… Kaysa hO ap Bhai..Meiny EIk WALI E KAAMIL Say In Prediction Ki Translation Karwaye Thi Aasan Alfaaz Mein..yani Jo HUZOOR GAHUS UL AAZAM REHMATULLAH ALAYH Ki Hay About HAZRAT IMAM MEHDI… Tou Unhony Farmaya ky Yahan Amr E Batoon Say Muraad HAZRAT IMAM MEHDI Ki APNI WAALIDAH Kay Pait Mubarik Yani Batan E Pak Say Wiladat Muraad Hay… Or 1400Hijri Mein WaalI Baat Pay Farmaya kay 1400 Hijri Yani 1400 Hijri Ka 1st Day To Last Day Muraad hOGA.. Kiu Kay YYahan 1400Hijri ka Aaghaz Hay..Yani 1400Hijri kay shuro mein he..1400 Hijri kay year mein.. tou Unhona farmaya 1400 mein wiladat ka matlab hay ka woh 1980-81 Mein Paidah Ho Chukay Hein Yani Hazrat Imam Mehdi, or HUZOOR PAK SallAllahu AlayhE Wasallam Ki Kam O Baish 2 Ahadees Or HAZRAT ALI RADI ALLAHU ANH ka 2 Irshadat Kay mtabik HAZRAT IMAM MEHDI Ka Zahoor 40yrs ki age mein hoga.. so 1980-81 Say count karein tou 2021-2022 Zahoor ka year banta hay 40yrs mukammal… or Humein yeh baat 10years say kuch Aulia sa sunn'nay mein aa rahi hay ka woh farma rahay thay kay 2021 mein zahoor e imam mehdi hojaega..jin mein Chishti Qadri or Naqshband silsilah ka AULIYA HEin.. or han apkay liye eik or gud news.. humara eik dost hain unko yeh prediction dikhaye gai tou unhona apna bhai kay sath iska ziker kia tou unkay bhai nay iska inkaar kia.. tou hmaray dost ko khuwab mein HUZOOR GHAUS UL AAZAM Ki ziyarat hoi kay HUZOOR GHAUS UL AAZAM OR MERA DOST OR USKA BHAI JO INKAAT KAR RAHA THA WOH Eik jagah walk kar raha hain..tou dost ka bhai HUZOOR GHAUS PAK say arz karta hay kay yeh mera bhai apka sath baat mansoob karta ha ka apna HAZRAT IMAM MEHDI Ka zamanah 1400hijri farmaya ha tou GHAUS PAK RUKH E ANWER MERY DOST KI taraf karty hain ..tou dost mera arz karta hay ka SARKAR Apnay he farmaya ha ka 1400 Hijri Hazrat Imam Mehdi kay Amr e Batoon sayy zahir honay ka zamanah hay..tou HUZOOR GHAUS PAK Farmaty hain kay han meiny he kaha hay 1400hijri ka Imam Mehdi kay bara mein…. Or Bro Woh Dum'daar sitarah bhi tuloo ho chuka ha jiska ziker HADEES Mein ha jo kay bahut bari nishani hay HAZRAT IMAM MEHDI kay zahoor o wiladat ki.. woh sitarah 1971 sa 1978 kay darmian tuloo ho chuka hay.. Is Sitarah Ka ZIKER Eik Hadees ein bhi hay Jo ka AL MUTAQQI AL Hindi Mein ha or Eik HAZRAT KAA'AB RADI ALLAHU ANh Ki riwyaat mein bhi ha jo HAZRAT IMAM JALALUD'DEEN SIYYUTI KA AL HAAWI LL FATAWA Mein darjj ha….